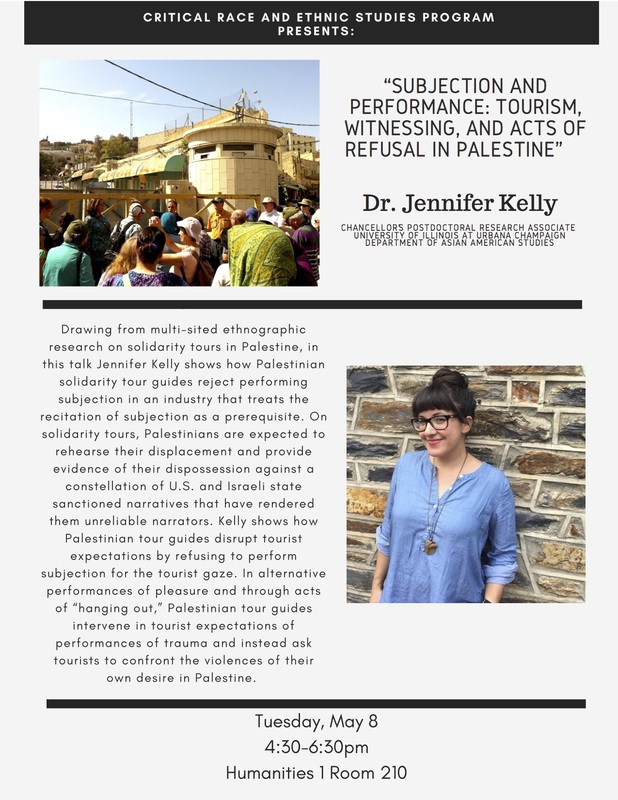 Drawing from multi-sited ethnographic research on solidarity tours in Palestine, in this talk Jennifer Kelly shows how Palestinian solidarity tour guides reject performing subjection in an industry that treats the recitation of subjection as a prerequisite. On solidarity tours, Palestinians are expected to rehearse their displacement and provide evidence of their dispossession against a constellation of U.S. and Israeli state sanctioned narratives that have rendered them unreliable narrators. Kelly shows how Palestinian tour guides disrupt tourist expectations by refusing to perform subjection for the tourist gaze. In alternative performances of pleasure and through acts of “hanging out,” Palestinian tour guides intervene in tourist expectations of performances of trauma and instead ask tourists to confront the violences of their own desire in Palestine. Jennifer Kelly is a Chancellor’s Postdoctoral Research Associate at the University of Illinois Urbana-Champaign in the Department of Asian American Studies.